I hope you all enjoyed the holiday season. Our Christmas was wonderful. Bob’s dad, my parents and my brother were with us on Christmas Day, as were all our kids and grandkids except for our son and daughter-in-law, who are still in Paris. They did visit us by video chat. We passed them around the room on my iPad for everyone to share a few minutes together. There were a few unusual or noteworthy things this Christmas Season. 1. We decorated the inside of the house early this year. It was complete before we left for Europe back on November 15. I did not want to return home on December 1, jetlagged and worn out, with that task ahead of me. 2. Our first weekend home, we decorated the outside of the house. We scaled back – no lights on the roof so we (meaning Bob) didn’t have to do any climbing. 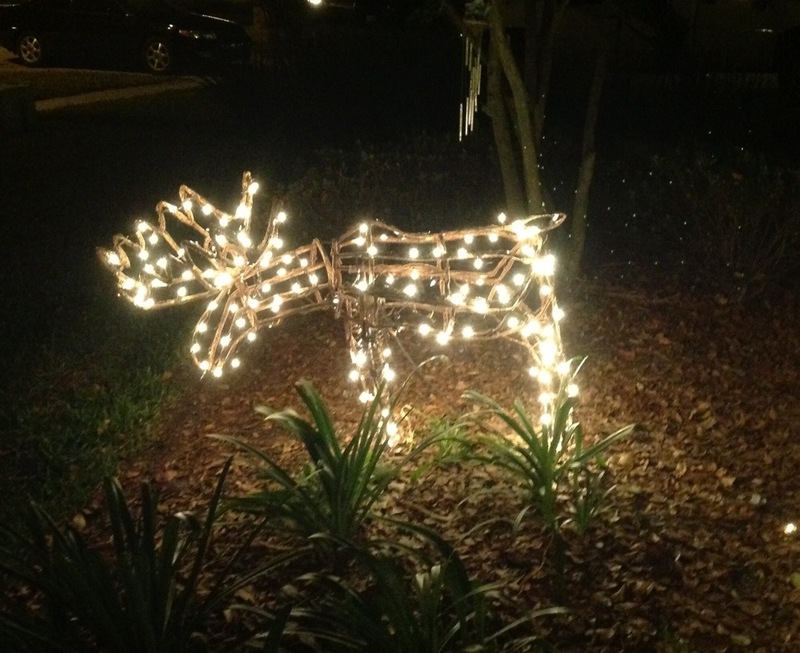 The mandatory outdoor decoration is my Christmas moose. He is made from grapevines and stands proudly in our front yard with his head swaying back and forth as he greets passersby. This year, however, the lights on his antlers didn’t work. In the dark it looked like a headless moose – not too Christmassy. We never got around to fixing him, but as we walked into the house the evening of Christmas Eve, we noticed he was fully lit from antlers to tail. That’s right – it was a Christ-moose miracle. 3. I saw Santa Claus shopping at Costco on December 23. Further proof that Costco has the best stuff. 4. On that same Costco trip, I was nearly run over by a man texting while driving a motorized shopping cart. Makes you wonder how he ended up needing that cart to begin with. 5. While waiting in line at the grocery store I heard the elderly woman behind me quietly singing Rudolph the Red-Nosed Reindeer. It struck me as funny that out of so many beautiful Christmas carols, this was the one she was singing. She must be a grandmother. 6. I did a photo Christmas card, which I have never done before. 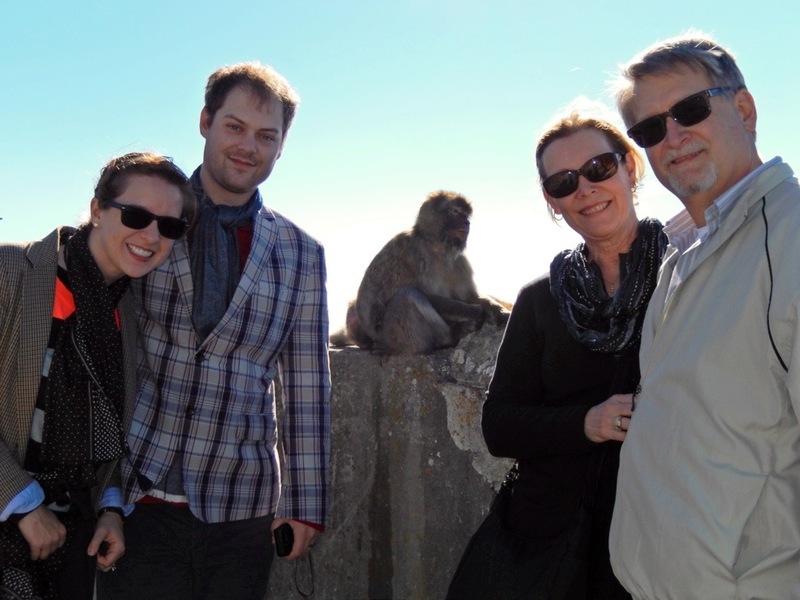 One of the photos was us posing with a monkey in Gibraltar. I mainly did this for my relatives who live out-of-state and figured it would be the only card they received with a picture of a live ape surrounded by family. This checks another thing off my bucket list. 7. I successfully made two new recipes for our Christmas meal. This is very unlike me on both counts – trying something new and having everyone like it. 8. There is one day out of the year that I can count on Bob being totally exhausted. That day is Christmas Eve. He hits the wall around 10:00 every Christmas Eve night without fail. I typically have crazy energy on Christmas Eve and am constantly amazed that he doesn’t. I’ll be getting stockings out to stuff and putting gifts under the tree and he will be down for the count. This year, however, Bob stayed up all the way until 10:30. That may have something to do with #9. 9. The stockings were stuffed and 95 percent of the gifts were wrapped by December 23. 10. Dena’s oldest three children painted a statue of whales for Bob’s dad. Dad is almost 91 and legally blind. He has a collection of carved animals, which he has acquired from all over the world. He was holding his gift and trying to figure out what it was. The kids told him it was two whales. He strained his eyes and asked, “Are they doing something obscene?” Another classic Grandpa quote. On that note, I wish you a Happy New Year! Thanks. I’ll get the recipes together for you.